Rathnew have jumped to the top of division one of the senior football league, after a late Mark Doyle free handed the Village a hard-earned victory over neighbours St. Pat’s on Thursday night. 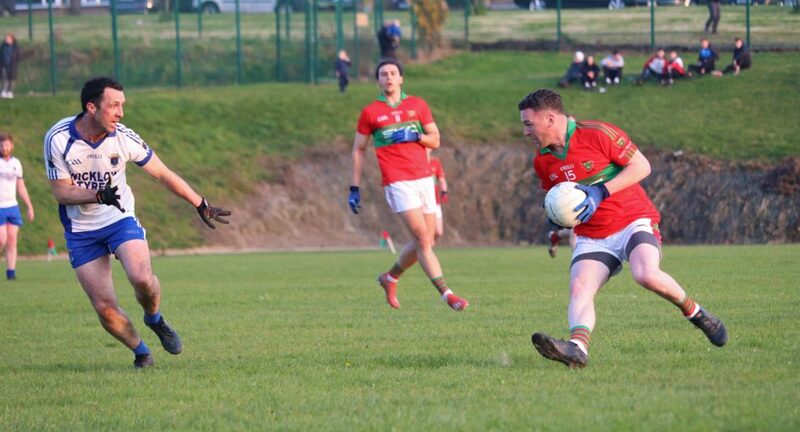 Knowing that a win would see them usurp Tinahely and Baltinglass ahead of their respective games this weekend, Rathnew looked well on their way to the two points after a second-half James Stafford goal. However, Pat’s rallied through a series of points from Tommy Kelly, setting the stage for Mark Doyle to seal the priceless victory in injury-time. Glorious sunshine and a gentle wind allowed for what would be an engaging game of football, as it took just 12 seconds for Pat’s to take the lead at the home of their fiercest rivals through Patrick McWalter. Rathnew rebounded quickly through Leighton Glynn (free) and Danny Staunton, before disaster stuck for a St. Pat’s side already missing Stephen Duffy and Dean Healy. Collecting a routine high-ball sent into the square by Glynn, Pat’s goalkeeper Colm Byrne landed back down on his right ankle awkwardly. Byrne immediately hit the ground in pain, and was forced off for Ian Murphy with just 13 minutes on the clock. Rathnew immediately took advantage of the forced substitution. Mark Doyle extended the hosts’ lead to three points, before Ross O’Brien split the posts on the turn, and Jamie Snell made the score 0-05 to 0-02 with just two-and-a-half minutes left in the first-half. Pat’s would finish the strongest in the closing stages. Matthew Traynor scored well off of a good ball in behind by Ruairi Marron, before Tommy Kelly (free), and Patrick McWalter drew the two sides level in time for the half-time break. Much like Pat’s did in the first, Rathnew gained the advantage seconds into the second-half through Graham Merrigan. Two further scores gave the hosts a cushion, before James Stafford put an indelible mark on proceedings. The influential Ross O’Brien gathered possession wide on the right-hand side, before dropping a high-ball on top of Stafford. The Rathnew midfielder claimed the ball with ease, before slotting it into the back of the Pat’s net, passed Murphy, who had denied him a similar opportunity minutes prior. Pat’s went about reeling back the five-point gap right away, as Ciarán McGettigan made a strong run through midfield, before passing on to Marron, who then set up Ciarán Doyle for the score. It was those charging darts through midfield where Pat’s were finding the most joy, as was evident when McWalter and Jonathan Delahunt combined for the former to reduce the gap to three. Both teams traded scores to make it 1-09 to 0-09, before Pat’s came back to set-up a grand finale. Tommy Kelly and Ciarán Doyle made the deficit just a single point, before Kelly stepped up with a great score from range to draw the sides level for the first time since half-time. Ultimately, it was Rathnew who would escape with the hard-earned victory when Mark Doyle stepped up with a minute remaining with a free to send the Village beyond Tinahely and Baltinglass to the top of the league. WicklowNews Player of the Match: Leighton Glynn (Rathnew). Rathnew scorers: J. Stafford (1-01), M. Doyle (0-02; 0-01f), L. Glynn (0-02f), W. Kavanagh (0-01), G. Merrigan (0-01), R. O’Brien (0-01), J. Snell (0-01), D. Staunton (0-01). St. Pat’s scorers: T. Kelly (0-06; 0-04f), P. McWalter (0-03), C. Doyle (0-02), M. Traynor (0-01).